When most people think of Wakayama, oranges and plums spring to mind. Most people don`t think of Ryujin, a small village located in a mountainous region of Tanabe city. It is located between the Kumano Kodo areas of Tanabe and Koyasan, and is the perfect place to stop and relax if you are exploring the region. There are several buses running daily which take you to Ryujin from the city of Tanabe with the journey taking one hour and twenty minutes, it`s a long journey but when the autumn leaves are changing colour and set against the backdrop of the mountains where you are treated to views of the Koya-Ryujin skyline it makes for a pretty one. The bus stop for the onsen is called Ryujin Onsen 龍神温泉 which is also the last stop on that route so it`s hard to miss! The undoubtedly most famous attraction in Ryujin is the Ryujin Onsen or hot springs, which is rich with history and said to be the third best onsen for beautifying your skin in the whole of Japan. With its beautifying mineral waters your skin feels unbelievably soft and replenished when you step out of the waters. The water gently removes oil from your skin leaving it feeling soft and smooth, it is also said that the water contains healing properties and drinking these waters is good for your health. There is even an Onsen-ji temple located nearby that was said to be built as a result of a monk healing from a skin disease after bathing in the waters of the Ryujin Onsen. 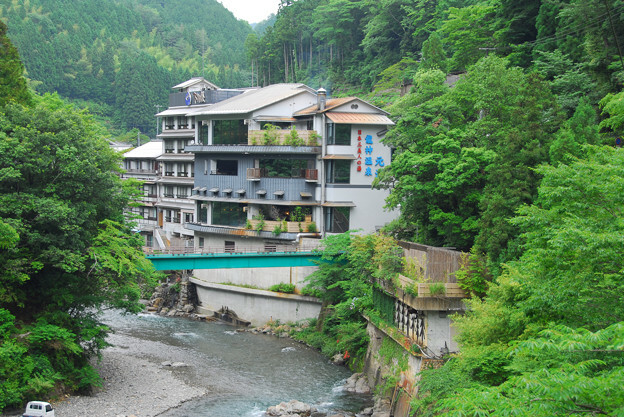 This famous onsen alongside others are situated overlooking the river making for a peaceful and serene setting. Many of the onsens and inns are located on the bank where the Hidakagawa river and the Komatagawa rivers join. If you head to Ryujin in the autumn you`ll also be treated to magnificent views of the red and yellow leaves that spread throughout Japan during the season. There are also many places to stay situated right next to the onsen, small traditional Japanese inns that will no doubt enhance your stay including the Shimogoten Ryokan. This unique Onsen was built in 1639 by the Feudal Lord of the Kishu domain making it rich with history and allows you to feel like you have truly stepped back in time! Many of the onsens situated in Ryujin also serve meals that contain fresh ingredients that have been sourced locally from the nearby mountains and rivers. There is also the Kamigoten Onsen which built in 1657 for the feudal lord of Kinokuni has been run by a family for 29 generations! You also have the option to stay in the Kirari Ryujin onsen located in Ryujin Onsen itself. The cheapest plan is 10, 500 yen to stay in the Japanese style rooms which includes meals. It`s not the cheapest stay but the Onsen gives way to some spectacular views! For a relaxing and peaceful getaway don`t miss out on one of the top three onsens in Japan!